Are you ready for some FOOTBALL?? 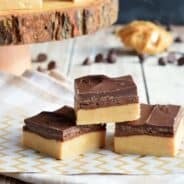 These Pumpkin Football Blondies are chewy and flavorful, with the perfect amount of chocolate frosting on top! It’s that season again. The time of year when I read tons of books, watch all my trashy shows on Netflix, and exercise like a crazy person. Yep. Football Season. I guess I’m fortunate that it’s not like basketball or baseball where they play 1 million games per season, every night of the week. However, with my son being out of the house now, it’s just my husband, me, and our three daughters. Needless to say, I feel sorta obligated to at least sit in the same room as him. So, if that’s going to happen, then so are these delicious football treats. Pumpkin and Football go hand in hand. They are basically the same season. So why not try to combine them? ). I used a football cookie cutter to make the shape (ok. lie. I used an egg shaped cookie cutter, and pinched the one side together…because my football cookie cutter disappeared a few years ago). If you want to just enjoy a chocolate pumpkin treat…forget cutting them in shapes. Forget piping on the frosting. 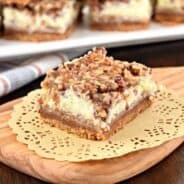 Instead, spread your frosting on nice and thick and then cut into bars. Easy peasy. So…which team do you root for? Or are you just a fan of the game day food? Preheat oven to 350F. Line a 9-inch square baking dish with parchment paper. Set aside. In a large mixing bowl, combine brown sugar with melted butter and pumpkin. Beat until smooth. Add in egg yolk. Add spices and flour, mixing until well combined. Pour into prepared baking dish. Bake for 25-30 minutes, until edges are lightly browned and toothpick comes out clean. Cool completely before adding frosting. For the frosting, beat butter, powdered sugar, cocoa powder and milk for 3-5 minutes until light and fluffy. Spread over cooled blondies. 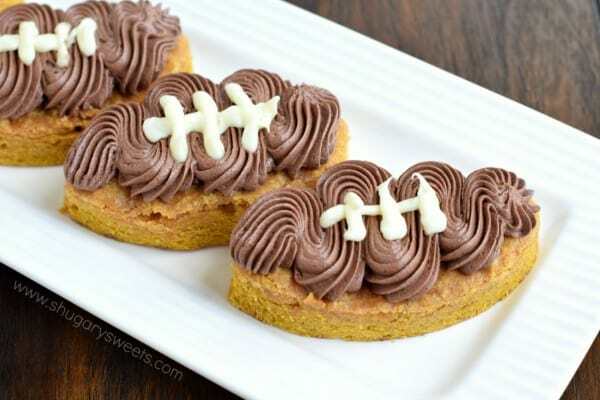 For footballs: using a cookie cutter, cut shapes out of cooled blondies. Using an open star tip, pipe football pattern onto each blondie. Pipe on laces using melted white chocolate. ENJOY. 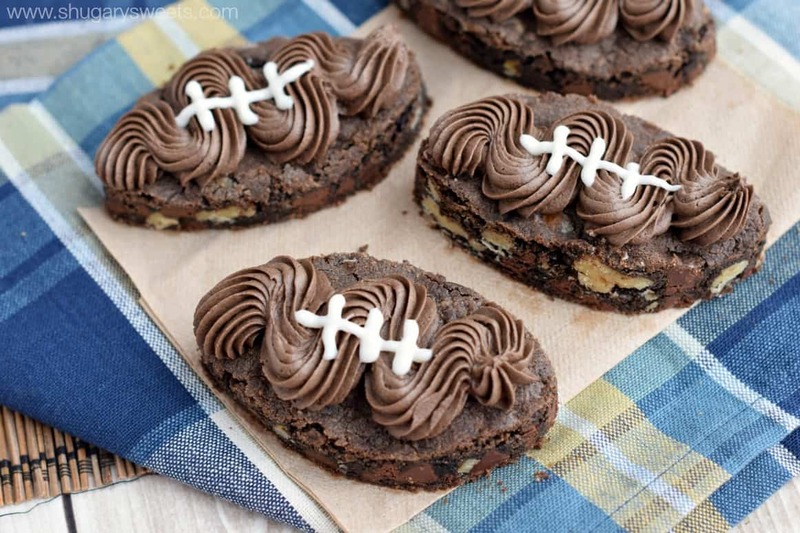 Chocolate Nut Football Bars: add these with the pumpkin bars to your dessert table. Options are good!! 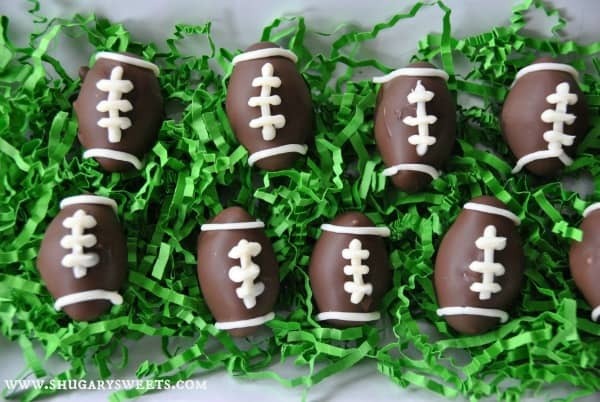 Peppermint Patty Footballs: homemade peppermint patties in the shape of footballs. These are a great after dinner mint! Chocolate Oatmeal Cream Pies: love Little Debbie? These chocolate footballs are amazing!!! Cookies and Cream Football Dip: This “cheese ball” is sweet and scrumptious. You’ll want one for game day! I am IN LOVE with these! My husband watches football obsessively, and I just don’t enjoy it. So now I can make these and “pretend’ to watch it, but really I’m just there for the food! Pinned! 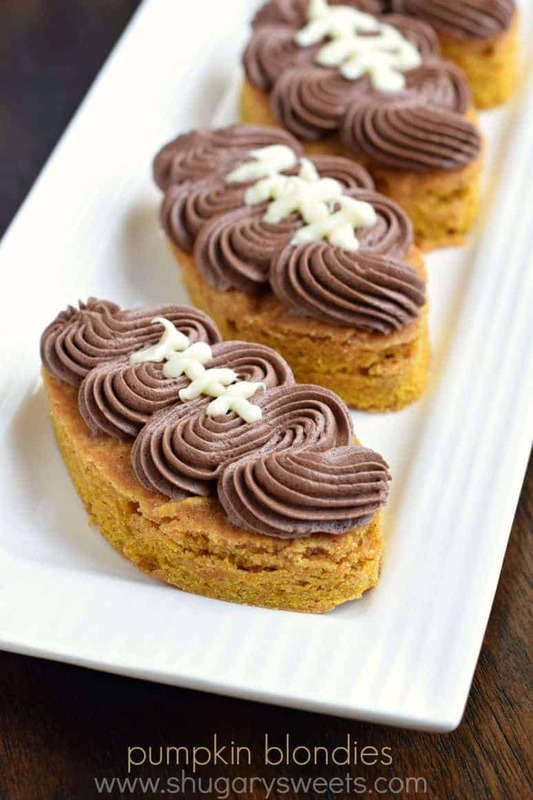 I love the combination of pumpkin and chocolate! These are perfect for game day! These look so adorable, and delicious! Yes, yep! I also get a lot of reading and Netflix watching in during this time of year. Oh these boys and their games… 🙂 These blondies are so cute and look so good! Alright. These are adorable. And I’m a man so I don’t want to say that outloud. But I have daughters and not sons so that explains a lot. These would make a great consolation prize as I watch the Buffalo Bills Loose. IT’s what we do in Buffalo. I laughed out loud when I read your comment about feeling obligated to sit in the same room with your husband. When our oldest son went in the military, I too felt I should sit and watch football with my husband. It’s been 4 years and our team (Redskins) have been so bad for so long, I no longer waste 4 hours of my Sunday’s watching them. I’d rather be baking some of your treats 🙂 These look great! 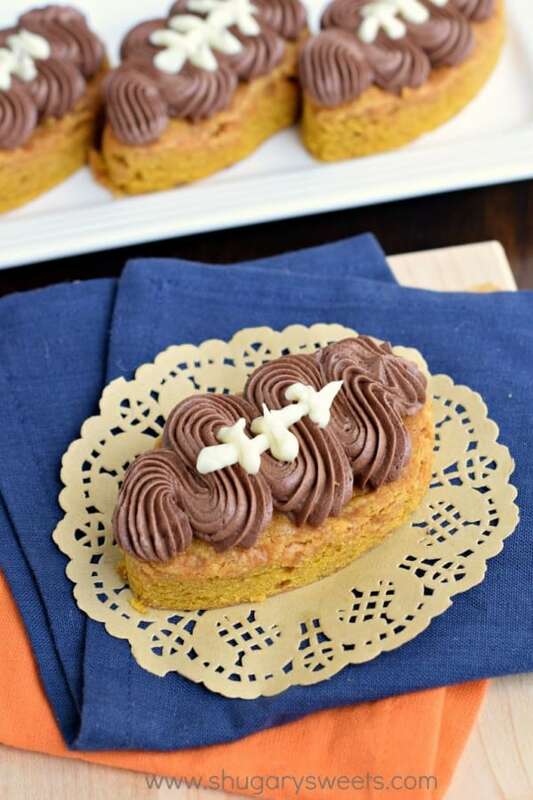 Pumpkin and football and pumpkin and chocolate go so well together! These are just so adorable! 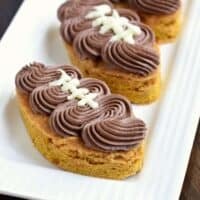 Pumpkin football blondies! I mean how cute is that!!! 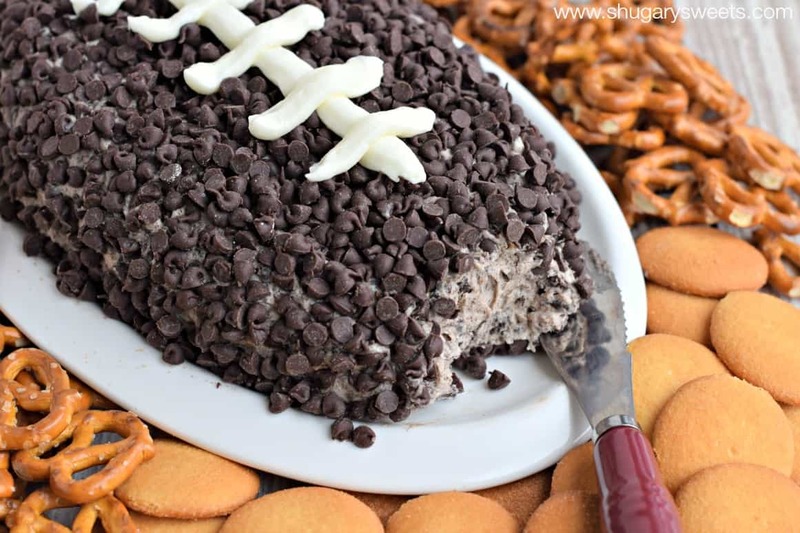 What a fun dessert for game day! 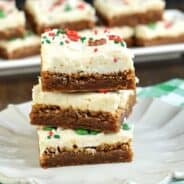 These look adorable and delicous! I can’t say I enjoy watching football, but I do love me some good football food! Love the cute shape and frosting!!!! “Just my husband, me and our three daughters.” Just? Seriously, Aimee, you are one strong woman. I have three kids and there’s no “just” about it, so we have a different chaos threshold! And I hear ya on the exercising while Netflix bingeing. I love exercising and I love Neflix bingeing, so yep, they have to go together. These are so cute! Shaping them like footballs should NOT be optional. They’re too adorable to resist! 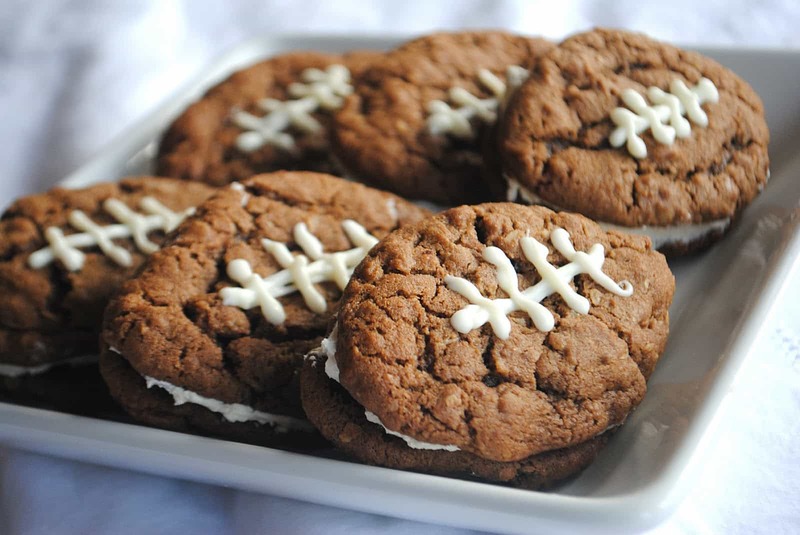 I’m not crazy about football myself, but I’m always excited for yummy football treats!